Redeem printable coupon and receive 20% discount on your purchase of $40 or more, or receive 15% discount on your entire purchase (no minimum). 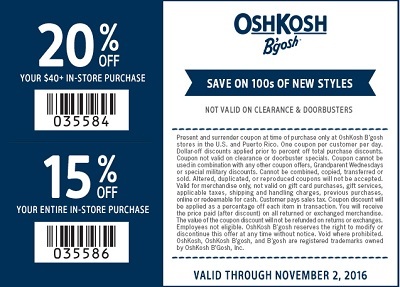 To receive the offer show the coupon to cashier at any U.S. OshKosh B'gosh store location. Hurry up, the offer ends today (11/02/2016)! Source of the information is OshKosh B'gosh. For more information visit your nearest U.S. OshKosh B'gosh store location.